Complete the look of your high back chair with the inviting designs of this ottoman. 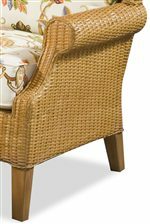 Tapered wood legs compliment the woven wicker design, while a box seat cushion adds comfort. Use as a relaxing footrest or as additional seating! The 1079 Wicker Ottoman by Braxton Culler at AHFA in the area. Product availability may vary. Contact us for the most current availability on this product.